Glad to hear it, Errowyn! What's with this night terror anyway? does anybody know what he wants? was it night terror really? wow! He kept sending me emails but i didn't do what he asked and since i didn't he kept sending them saying it was OK and that he was Brian. I almost fall for that tho. Jass - I think alot of people ask to be on tv. I think its part of the job? So far my doco will be named - "I'm A Leaper"
- What are your feelings about Quantum Leap? 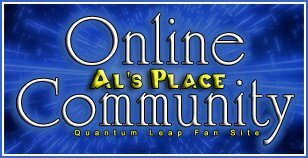 - What does Quantum Leap mean to you? - Why do you watch it? Everyone - I do have some short videos on myspace. Click on videos to see them ok. I'll post more up soon. Can I ask you something systemcat? How did you draw the 3D art? All these nice messages from people! I want to apologize for the posting of the the email I received from night terror. I did have a reasoning for it - altough I won't say why because I made a mistake. I am using another e-mail address now. I'm not worried that I received an e-mail from this person. But I am worried about private info being used in a mean manner. Or people's names being faked. Just to let everyone know - I received a not so nice e-mail from 2 former members of this forum. Great stuff matey - good luck! My thoughts are still with your mum. I really do hope she gets well. Have you got coffee cup? Fairly good software to have. It's amazing what animals do. Wow! It's amazing what animals do. You will see the picture of me with my sunnies on. Under that picture there should be 2 words if I remember right. Hope you get well soon matey. I've already made some short clips of music and scenes. I should post them up. Actually I will - I could use some feedback and see what people think. I'm about a quarter of the way through filming so far. I have a lot of scenery shots. I have a few shots of myself speaking of my thoughts on the show.